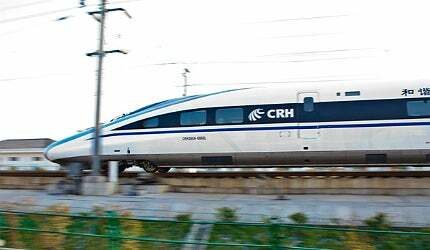 CRH380A is a high speed rolling stock which was developed by China South Locomotive & Rolling Stock Corporation (CSR). Image courtesy of Jucember. CRH380A is currently manufactured by CSR Qingdao Sifang Locomotive & Rolling Stock. Image courtesy of Jucember. CRH380A is currently the world’s fastest train. About 67 CRH380A are running along the Beijing-Shanghai high-speed railway, of which 21 were delivered in August 2011. Image courtesy of Jwjy9597. CRH380A has many inbuilt luxury futures. Image courtesy of Heights. The VIP cabin in the CRH380A is just beside the driver’s cab. Image courtesy of Vladimir Menkov. It is being manufactured by CSR Qingdao Sifang Locomotive & Rolling Stock. The train was put into regular operation on the Shanghai-Nanjing high speed railway line and Shanghai-Hangzhou high speed railway line from October 2010. It was put into daily service along the Wuhan-Guangzhou high-speed railway in December 2010. It is the world record holder in the fastest train category, hitting a speed of 486.1kmph on the world’s longest high speed line in China. The proposal to design a high speed train set started in early 2001. In February 2008 the Chinese Ministry of Science and Ministry of Railway signed an agreement on development of innovative high speed trains. It was planned that a new generation high speed train would be developed which could continuously operate at a speed of 350kmph. The project was included in the 11th Five Year Plan. The train sets were built and put into tests by early 2010. "The train was put into regular operation on the Shanghai-Nanjing high speed railway line and Shanghai-Hangzhou high speed railway line from October 2010." The design work was carried out in four main categories: schematic drawing, technological planning, structuring and building and experimentation. Based on the analysis, an optimised sub system design was put forward. More than 20 designs were shortlisted and were sent for further optimisation and simulation. Around 1,000 technical tests in 17 specific areas, such as dynamic performance, pantograph, aerodynamic and traction performance, were conducted. The technology to increase the maximum speed of the train was discovered through research carried out at various universities of China and was fed into the CSR’s design. The body is integrally welded with aluminium alloy and is shaped with a fish head-like structure in the front. The rotating paraboloid wedge structure cuts down aerodynamic resistance and mean energy consumption throughout the runtime. It also increases the amount of regenerated energy. The new generation high speed electric multiple unit uses the electro pneumatic compound brake mode in which the train will use most of the regenerative braking energy. In the mean time the traction motor will convert the energy into required power by means of a power generator. As a result of this the maximum power of the train increases by 50%, which helps in terms of exceptional energy saving. The train is designed to be completely vibration free. The train bogies are designed to be safe and reliable. They can withstand and run through a critical speed of 550kmph. They are also incorporated with an advanced noise control technology by using new sound absorbing and insulating materials in the construction. The new generation train set comprises of various lounges and deluxe six seat compartments. It has a separate dining car called the Bistro Bar where snacks and selected meals are served. There are also separate bar counters where passengers can have a drink if they wish to. "It is being manufactured by CSR Qingdao Sifang Locomotive & Rolling Stock." A VIP sightseeing zone is adjacent to the driver’s cab. It has an electronic curtain for which the water fog layer on the glass of the electronic curtain disappears instantly on the pressing of a button and gives a view of the running train from the driver’s angle. Each seat in the train is equipped with a display, dashboard, reading lamp and power port. Rotating seats are installed throughout the compartment. Special facilities are provided for disabled people. One disabled toilet per compartment is installed with facilities such as an automatic door with on-off button, barrier free wheel car passage, handrail for the disabled and infant care table. CSR was awarded a contract worth $215.77m by Hong Kong-based MTR to supply the CRH380A train sets to operate on the Guangzhou-Shenzhen-Hong Kong express rail link which is expected to be functional by 2015. The train sets will be customised according to MTR requirements. CSR has delivered 40 train sets for operations on Shanghai-Hangzhou, Shanghai-Nanjing and Wuhan-Guangzhou high-speed railways in January 2011. About 67 EMUs are running along the Beijing-Shanghai high-speed railway, of which 21 were delivered in August 2011.